April 1, 2018 at 12:37 pm. Barna, in partnership with Bible Study Fellowship, surveyed Christians in America who participate in Bible studies, to learn more about how, why and when they study. Participating in a “Bible Study” is defined as using prepared Bible study materials both individually and in a group. Fifty-eight percent of Christians choose to participate in a Bible Study (3 in 5). Evangelicals engage in a Bible study at the highest rate (80%), while 58% of non-evangelicals participate, and notional Christians at a rate of 49%. Millennials participate in Bible study at a rate of 72% — the highest of any generation. The most Millennials also meet in person for Bible study, at 38%, with 26% of Gen Xers meeting in person, 21% of Baby Boomers, and 22% of Elders. Elders participate the least in Bible study overall, at 37%. The percentage of Christian Americans who choose not to participate in Bible study say they believe that studying at services is sufficient (26%), have a lack of interest in it (25%), or don’t have enough time (23%). Nearly half (48%) of Christians participate in Bible study on a weekly basis. Two-thirds (66%) study in a group, with 57% attending in the evening. A large percentage of these groups, at 76%, are mixed gender. Surprisingly, Christian parents with children under 18 prioritize Bible study (68%), while 52% who do not have kids at home participate. Regionally, the Midwest has less involvement, at 49%, while the South and the West have similar rates of Bible study participation (63% for the South; 64% for the West). Christians living in rural areas participate at a level similar to those who live in urban areas (61% for rural residents; 68% for urban). Seventeen percent of those who live in urban areas also use online and app tools for Bible study, and 14% of rural areas use these tools, as well. Those who live in small towns use technology-based tools less frequently, at 8%; this is a similar rate to those who live in suburban areas (9%). Christians living in the suburbs engage in Bible study at 52%; this is compared to Christians living in urban areas, who engage in Bible study at 68%, and rural areas, at 61%. Attendees of large churches — defined as 1000+ — don’t necessarily have the highest rate of Bible study participants. More than half (52%) of these congregants participate in Bible study, while those who belong to a church with attendance of 100 – 500 attend at a rate of 60%, and members of small churches (less than 100) attend at a rate of 59%. Reasons for joining a Bible study include “a desire to grow in one’s faith” (54%) and “wanting to understand the Bible better” (32%). Personal expectations and achievements related to attending Bible study include “significant growth in my faith” (69%), “gaining a better understanding of the Bible” (70%), “helping me understand how to apply the Bible to my life and the culture I live in” (63%) and “developing fellowship and community with other Christians” (50%). Thirty-nine percent chose personal growth as the most important goal of Bible study, and 21% chose “to better understand how the Bible applies to life.” Twenty-one percent also wanted to simply understand the Bible better, while 9% say they want to build a community with Christians. Five percent said that learning more about being a Christian was their most important goal. In a study commissioned by Youth Specialties and Youthworks for Barna, it was discovered that youth ministry staff often consists of one person. More than half (55%) of churches have one paid member of staff in charge of youth, while 17% have more than one. Half (49%) of youth pastors are 30-39 years old, while 18% are 26-29 years old, and 16% are 40-49. Forty-seven percent are college-educated, and 34% attended seminary. Just 7% had “some” seminary training. One-quarter (24%) of senior pastors consider it “extremely” important to have this kind of education, while 43% say it is “very” important. This demonstrates the importance of youth ministry training to senior pastors. Most (84%) of youth pastors are married, while 16% have never been married or are no longer married. Most (81%) of youth pastors are male. An average of 12 adult volunteers help with the youth ministry; five of these volunteers are typically parents of youth members, with 42% volunteering regularly and 33% volunteering occasionally. The number of volunteers correlated to both youth group size and church size. A recent study by the Charities Aid Foundation (CAF) shows the United States is the most charitable nation on Earth, with Americans donating 1.44% of their GDP (gross domestic product) on average. Not all American states, however, are “created equal” when it comes to giving. Certain areas of the country perform better than others, along with specific demographics. As illustrated by an interactive map by Rawhide.org depicts how each individual state donates. 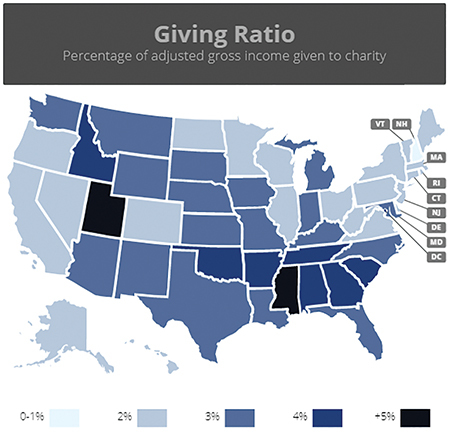 • Only two states had a higher-than-5% giving ratio (percentage of adjusted gross income given to charity): Utah (6.61%) and Mississippi (5.04%). Seven other states came in at more than 4%. • Republican-leaning states did very well in the area of money donated. Research by WalletHub shows that Republican states historically donate more money than their counterparts. • The South showed its hospitality performing very well in the study with Mississippi, Tennessee, Georgia, Oklahoma, Alabama, North Carolina, Arkansas, South Carolina and Texas all finishing in the top 15. • Idaho came it at 4.2%, which is on par with some of its Republican brothers and sisters. Most surprising, however, is that Idaho doesn’t have a single charity listed inside the top 400 in the nation. • States that ranked higher in per-capita church attendance consistently ranked higher in amount of money donated. This was true on the opposite side of the spectrum, as well, with New Hampshire having a low percentage of churchgoers per-capita to go along with its last place rank for money donated. • Hawaii donates just 2.77% on average, but Hawaiians who make between $50,000 and $100,000 per year donate more than 6.1% of their discretionary income. • Similar to Hawaii, families with yearly incomes of $50,000 to $100,000 donated roughly 40% more than those with larger incomes. • Unfortunately for New Englanders, New Hampshire donates just 1.85%, coming out to slightly less than $1,500 per household annually — the lowest level in the nation. • Some states prefer to donate their time instead of their money. Mississippi, which ranks No. 2 in money donated, falls to 47th in volunteer hours. Utah, however, is the exception — it ranks No. 1 in both money and volunteer time donated. From a bird’s eye view, there are possible holes in the data due to a lack of individual-donation reporting. For instance, the statistics listed only take into account legally claimed contributions. Two-thirds of Americans (66%) never itemize their donations — making those gifts impossible to track. This research is provided by Robbie Richards, a member of the content marketing team at Rawhide Boys Ranch, a non-profit organization that supports at-risk youth in Wisconsin. Footnotes were omitted. Barna, in partnership with Brotherhood Mutual, recently conducted a study that focused on the transition to a new church leader. The survey included a national sample — of Protestant congregation members, incoming senior pastors, staff, and outgoing senior pastors — that had experienced a pastoral transition in the past five to seven years. Findings showed that priorities determined by the pastor during transition correlated to the impact of the transition itself. Highest priorities for succession, according to congregation members, ranked as: an emphasis on maintaining church unity (42%), sustaining vision (32%), financial stability (7%), and fresh growth (9%). Churches that experienced priorities of “financial stability” had different experiences during transition; the study reveals finance-based priorities often negatively impact relationships within the congregation, between members and leaders. Leaders also feel that it increases emotional burden. Just 36% say the transition, when based on finance, went “extremely smoothly.” With a focus on sustained vision, members said that the transition went extremely smoothly at a rate of 57%, and a focus on church unity delivered “extremely smooth” results, at a rate of 52%. A fresh growth priority experienced an extremely smooth transition at 46%. Eighteen percent of congregants who were a part of a church that focused on financial priorities said that there were “major obstacles” to the transition. Just 7% of those in churches with other priorities reported similar challenges. When searching for potential reasons for increased obstacles with financial-based priorities, communication about the different priorities was a factor; speaking about unity with congregants is often discussed, while financial discussions often happen among leaders alone. 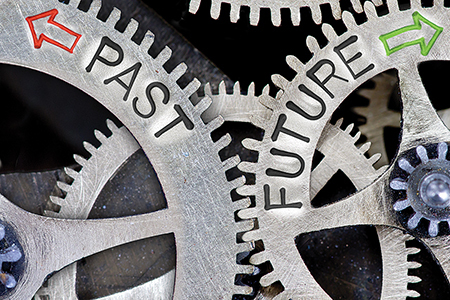 Nearly two-thirds (62%) of churches who focused on sustained vision said their leadership communicated “very well” about reasons for succession, and 52% who focused on church unity reported they also communicated “very well.” Almost half (46%) of congregants who belonged to a church that prioritized fresh growth thought the communication went very well, and 36% of those who belonged to a church that prioritized financial stability say leadership communicated very well. Just 12% of congregants who attended a church focused on church unity and sustained vision believe their relationship was weak with leadership, and 14% of those focused on fresh growth also say their relationship was weak. This is compared to 31% of congregants who say their relationship with leadership was weak when there was a focus on financial concerns. For incoming pastors, if a church was more focused on its finances during succession, worry was one of their main emotions, at 61%. More than 1 in 4 (28%) new leaders felt worried if the church was focused on unity; 25% were worried if the focus was fresh growth; and 17% were worried if the church was focused on sustained vision. In a succession focused on finances, new pastors experienced other feelings such as: doubt (39%), regret (33%), nostalgia (33%) and confusion (28%). Thirty-nine percent of incoming pastors to finance-focused churches also said that unity between elders was either weak or very weak. About one-quarter (24%) of pastors who prioritized growth felt this unity to be weak, while 18% of those who prioritized unity and 7% who prioritized sustained vision felt that unity between elders was weak. Only 15% of congregants who went through a financially fraught transition saw unity amongst the church as very weak; less than 5% of those who were a party of differently prioritized transitions felt this.